Cleansing rituals are popular with Wiccans and they do have their benefits. The main reason for cleansing as far as Wiccans are concerned is to purify and rid themselves and/or their ritual area from negative energies that might be present. The cleansing ritual often involves anointing with fresh salt water and also saying a blessing. In this example photograph a gorgeous Wiccan goddess named Monica has cleansed and set up her own unique altar. Her selection of items for her altar all have personal meaning to her. The items were purified before placing them in the altar. Some rituals are to clean oneself in preparation for each ritual. This cleansing is often done with salt water and blessings. For example, the skin on the neck or throat might be anointed or dabbed with fresh salt water to purify it for the speaking of the spell. The body might be anointed in several places, or even by taking an herbal bath, to purify it and rid oneself of negative energy. 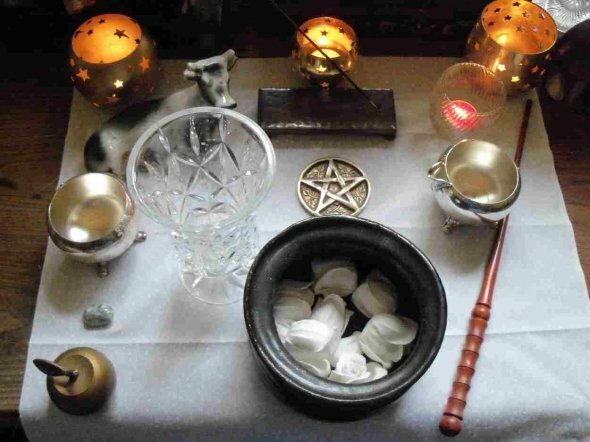 Another common cleansing step for Wiccans is when they are preparing ritual tools that they have gathered together for the purpose of casting a spell. Cleansing and preparing ritual tools is a big deal to Wiccans. They take great care in setting up an altar for rituals and casting spells. Once they’ve gathered what they need together for a spell, they want to clear those tools of any and all energies they’ve collected. Purifying the ritual tools is done as soon as possible. The cleaning process does not have to be complicated and can be as simple as cleaning in cool water. Which type of cleaning ritual is selected depends on the witch’s preference. She might be cleansing the objects with water in the moonlight, cleansing the tools in fresh herbs or flowers, burying the tools in dry sea salt, refreshing them with sage or cedar incense, cleaning them with fresh sunlight, blowing on them, or running cold water on them. Wiccans believe that a purified object is substantially more powerful than a contaminated one. The magick of a purified object is less likely to go awry. More importantly, when trying to cast a spell a Wiccan wants to make sure that all negativity has been removed from all objects to be involved in the ritual beforehand. That way, what she hopes for the spell to do has no chance to be corrupted by using impure ritual tools. Posted on July 4, 2012 by admin. This entry was posted in Cleansing. Bookmark the permalink.